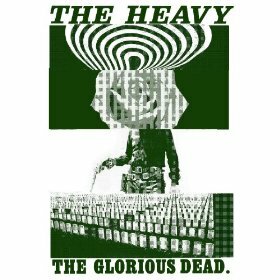 It becomes quickly evident that The Heavy’s new album, The Glorious Dead, exists to paint a sonic picture of pulverizing power and sweaty, slightly-buzzed dominance even though, lyrically, there is a charm and a humanistic thoughtfulness. The soul-infused heavy hard rock is a bar brawl where the winner is thrilled they won and the loser is smiling, knowing they survived. With gigantic drums, towering vocals, colossal guitars and an unapologetically raucous horn section, The Glorious Dead should be one of the most sought-after albums as it contains tracks most would seem eager to add to any badass gangster, boxing, or suspense film that may go into post-production in the next year. Even the string section’s composition at the end of “Can’t Play Dead” feels symbolically evil and triumphant at the same time. “Curse Me Good” is a slight detraction, saturated in bluesy acoustic guitar chords. Singer Kelvin Swaby’s previously hardened vocals are less in veracity and more softened with thoughtfulness while the harder rock medium is decorated with a bit of a ’60s pop push. The Heavy are from England and their work has been featured in a whole host of film, TV, news programs and video game soundtracks. Swaby’s vocals are to be admired as they feel as hard as a fistful of diamonds made even stronger audibly with a brawny, full-bodied band.